Izu Ugonoh. Photo Credit: Sky Sports. Hard-hitting Polish heavyweight prospect Izuagbe Ugonoh 18-1 (15) has been drafted into Alexander Povetkin’s training camp as the 39-year-old Russian seeks sparring partners that can replicate big-punching Brit Anthony Joshua ahead of their heavyweight title fight at Wembley Stadium in London on September 22. Speaking to Sky Sports, Ugonoh said his style is the perfect match for the 21-0 (20) Joshua, particularly his right cross. IBF, WBA and WBO heavyweight champion Joshua, 28, is a clear-cut favourite to defeat veteran Povetkin 34-1 (24) who has only ever lost to former undisputed heavyweight champion Wladimir Klitschko in a world title fight five years ago. “I consider myself a strong guy. 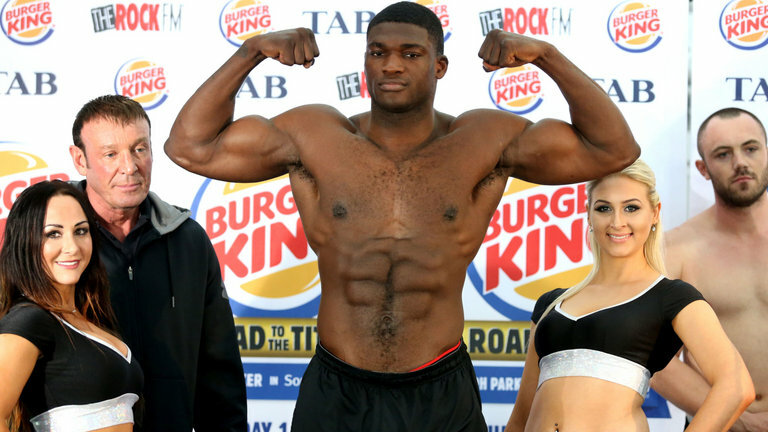 I know Joshua is a tall guy, he’s taller than me definitely, but I’m taller than Povetkin, so I’m sure that will be helpful,” continued the 31-year-old Ugonoh, who was upset by Dominic Breazeale 19-1 (17) in a knockdown-filled brawl that he lost by KO5 in February last year. Meanwhile 20-year-old British prospect Daniel Dubois 8-0 (8) has flown out to Russia to lend his assistance to Povetkin. “Landed in Russia with my coach Martin for sparring with Alexander Povetkin,” Dubois posted on Twitter on August 29. Back in the United Kingdom, Joshua is putting in work with Scotland-based Congolese prospect Martin Bakole Ilunga 11-0 (8) who was last in action with a first round TKO of DL Jones 8-2-1 in Glasgow, Scotland in June. In his last fight Povetkin had to pick himself up off the canvas in the third to stop David Price in five rounds with an impressive left hook knockout.